Saturday, March 7, 2015 marks the 45th anniversary of one of the great performances in NCAA Tournament history – a performance turned in by one of Washington, D.C.’s greatest players. Austin Carr, who played his prep basketball at now-closed Mackin High School in the District, set an NCAA record with a stunning 61-point outburst in a first-round game between Notre Dame and Ohio University back in the first week of March 1970. Austin Carr at the foul line during his record-breaking 61-point performance in the 1970 NCAA tournament. Carr’s performance is that much more impressive when you consider that college basketball had no 3-point line at the time and no shot clock to speed up the game. Carr could (and did) shoot from anywhere, and yet despite all the changes that have come to the game since, no one has come close to matching his scoring record. The only time anyone has come within a dozen points of Carr’s NCAA record was in 1987 when David Robinson (another D.C.-area product) tallied 50 points against Michigan. When D.C. area basketball fans think of local players who starred at Notre Dame, they usually focus on future NBA scoring champion Adrian Dantley. Dantley played at DeMatha, then Notre Dame, before going on to become a Rookie of the Year in the NBA, a two-time scoring champion and, ultimately, a Hall of Famer. Injuries kept Carr from achieving what he might have as a professional. Then again, Dantley couldn’t match Carr’s college accomplishments, either. Carr owns three of the top five NCAA Tournament single-game scoring performances and five of the top 12. The boxscore from Carr’s breakout game – a 112-82 Notre Dame victory – shows that he hit 25 of 44 from the field (.568) and 11 of 14 from the line. Though his shot total (44) was inordinately high, Carr was anything but a gunner. He was a master at moving without the ball, getting himself open in positions on the floor where he could score. Notre Dame accumulated 28 assists in the game – including a whopping 17 by point guard Jackie Meghan. That’s an indication that Carr was getting his points in the flow of the game, rather than taking matters into his own hands. Carr somehow picked up three assists himself, not to mention six rebounds, just one turnover and one foul. His record scoring outburst wasn’t exactly a surprise. He averaged 38.1 points per game during his junior season in 1969-70. But he always seemed to save his best for the NCAA Tournament. He averaged 52.7 points in three tournament games in 1970 and averaged 41.3 points for seven NCAA Tournament games in his college career. 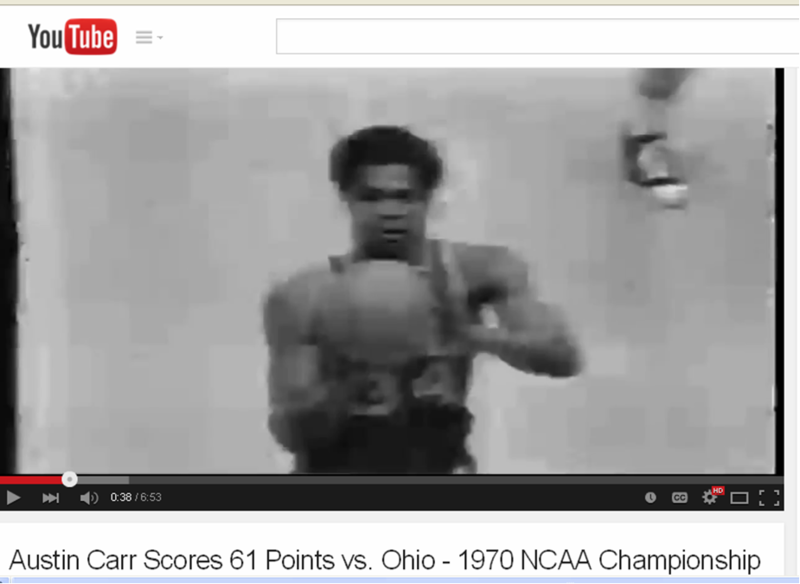 Here’s a highlight tape from that record-setting Notre Dame-Ohio game in the 1970 NCAA Tournament.